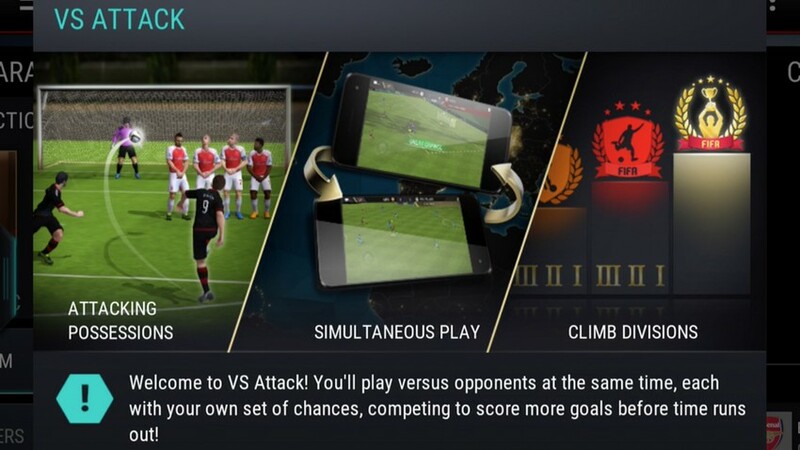 FIFA Mobile's VS Attack mode is a new multiplayer mode that focuses on delivering a quick and easy match experience that is more exciting, engaging, and fun! Continue reading to learn how VS Attack works. VS Attack takes everything you know about Attack Mode and gives you a quick and easy way to play against other people. No more waiting for others to play their turns. In VS Attack, you'll connect to an opponent in seconds, play against each other's line-ups in a two minute match and once you're done, it's off to the next one. Once you're connected, you will each get about 15 seconds to select your Formation and Tactic before the match loads. The Formation you pick is the one your opponent plays against. Meaning that if you go for an Attack Formation like 3-4-1-2, your opponent will be facing off against your three defenders on their turns. Once a VS Attack match begins, the 2:00 timer starts and you'll have that much time to score more goals than your opponent. The clock does not stop for corners, free kicks or penalties, so you'll have to play efficiently if you hope to win. EA has also removed replays after goals or huge saves to make sure you have the most chances to score in each match. Although you aren't playing against someone in a regular match, each player is getting live feedback on what their opponent is doing. If they're encountering a Counter Attack situation, you'll be notified of it. If they just scored a goal, you'll know it and the pressure is on you to do the same. After the timer is up, you'll get a notification screen to let you know how well you did versus what your opponent did. There is no extra time in VS Attack, so you'll want to go for the win ineach match you play. At the end of each season, you'll be rewarded with a prize pack. Higher divisions mean better prizes. The division you end each season is also the division you start with, the only thing that resets is the number of fans you start with. So, if you finish a season as a FIFA Champion, you'll start the next season in FIFA Champion but with the base number of fans. Every time you win a match in VS Attack, you'll receive a Victory Token and based on the division you are at, you'll also get Division Tokens. Both Tokens are necessary to unlock and upgrade the VS Attack Players. You will also be able to buy VS Attack Packs in the store to help you improve your players quicker. However, you can only get VS Attack Tokens for the division you are in. Meaning, if you are in Pro II only Pro II VS Attack Token Packs are available in the Store. The does VS Attack Mode Begin?